!! Happy New Year to all Iranians and other people who celebrate the coming of the spring !! The grandeur, beauty and spiritual power of Persia's rich musical history is eloquently laid out on the two-CD set Faryad. 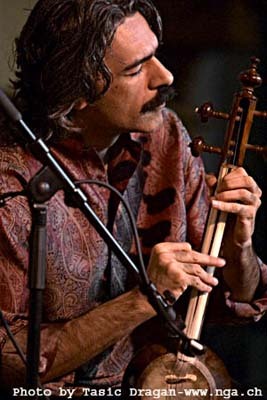 Legendary singer Mohammed Reza Shajarian, kamancheh (spike fiddle) player Kayhan Kalhor, tar (plucked lute) player Hossein Alizadeh and vocalist (and Mohammed's son) Homayoun Shajarian, join together to present a seamless landscape of Persian music. Linked to the mystical sufi tradition as well as medieval royal courts, classical Persian (Iran) music embodies meditation, vocal precision and improvisation. Masters of Persian Music: Faryad works with the innovations of the super group, allowing new melodic and polyphonic structures to be introduced. The effect is a stunning array of soothing, multi-dimensional music. As a meeting of living masters, this collaboration between legendary vocalist Mohammed Reza Shajarian, his multi-instrumentalist/apprentice singer son, Homayoun, kamancheh (spike fiddle) virtuoso Kayhan Kalhor plus Hossein Alizadeh, a noted exponent of the tar (lute) would be hard to top. Thus, it is not surprising that their recent USA tours were routinely sold out or that their debut album, Without You, was nominated for a 2003 Grammy. The tradition these artists so peerlessly exemplify is drawn from medieval Persian court music and Sufi devotional poetry. Intricate melodies flow outward from ancient modal tunings as the scratchy violin, rumbling tombak (a goblet-shaped frame drum) and plangent plucked strings alternatively mirror, augment and embark from Shajarian Senior¹s plaintive, soaring, preternaturally fluid flights of improvisation. That the performances were captured live under ideal sonic circumstances transmits all the immediacy of witnessing epochal interpretations as they flower from seed to deliriously fragrant full bloom. –Christina Roden.